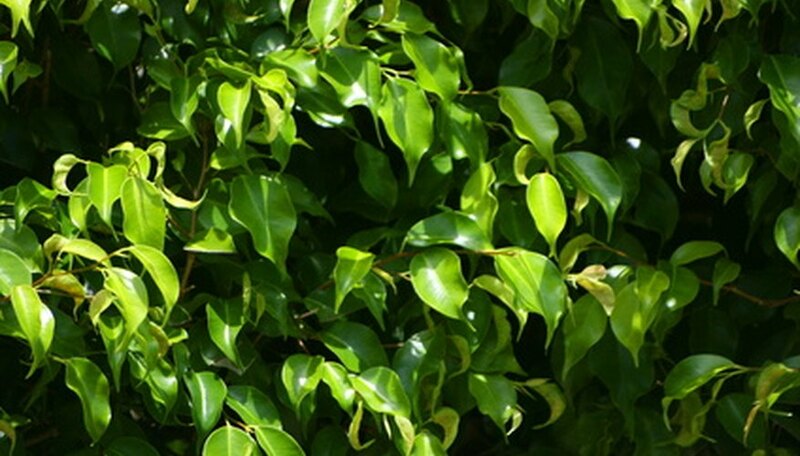 Beautiful, glossy kelly green leaves with pointed tips and wavy margins are one of the key ornamental features of a ficus hedge made from weeping fig (Ficus benjamina). Since this tree is fast growing in the heat and moist soils of summer, it also is regarded by landscapers and privacy-seekers as perfect for creating hedges. Ficus naturally grows 60 to 100 feet tall and more than 100 feet wide if never pruned--the perfect tropical shade tree. Weeping fig grows into a massive, voluptuous canopy of attractive foliage on weeping, flexible branches. Popular as a houseplant or as a bonsai subject, weeping fig grows 24 to 36 inches a year in containers when restricted with root pruning or container size, according to the My Bonsai Care Guide website. In the ground, ample soil moisture and fertility, along with heat and high humidity, can increase the growth of branches to 3 to 8 feet each year. If inadequate sunlight reaches the plant, fewer leaves are produced or retained. This creates a hedge that is scraggly and easily seen through. The fast growth and many branches of weeping fig allows gardeners to prune it to increase branches and create more dense leaf production--perfect for hedges. The inherent trouble with a fast-growing, naturally large tree that is pruned into a precise, manipulated hedge size and shape is the need for repeated pruning. Monthly pruning (or sheering) of a weeping fig hedge may be required to remove the 4 to 8 inches of new growth every few weeks in the summer rainy season. Regrowth is a bit slower in the cooler, drier months, but trimming is still required if a manicured, formal hedge appearance is sought. Moreover, the sticky white sap that oozes from both leaf and stems from the fig is problematic in keeping pruning blades and hand grips clean. A skin rash can arise if the sap gets on skin, and if mixed with sweat and accidentally placed in the eyes, can cause acute pain. Horticulturists from the University of Florida Extension, and in "Tropical and Subtropical Trees," attest to the aggressive growth of weeping fig's tree roots. As one source comments, "the subterranean roots are extensive both above and below ground, taking advantage of any water sources from pools or pipes, and heaving of driveways and sidewalks." Unlike bonsai, hedge plants are not root-pruned to contain their growth. As the leafy boughs are constantly trimmed and the plants age and get larger, the root systems continue to spread out into soil to obtain nutrients and water. The U.S. Forest Service comments that weeping fig (and many other tropical fig trees) are extremely sensitive to frost and subfreezing temperatures. While a cool, dry winter significantly reduces the growth rate of roots and branches, temperatures at or below 32 degree F kills foliage. Brief exposure to frost may cause unsightly defoliation, but prolonged cold can fully kill branches. Extreme cold will cause die-back to the trunk base so that the hedge must rejuvenate from new watersprout (suckering) growth from the roots in spring. Just like frost and freezes can defoliate weeping fig hedges and even cause branch die-back, pests can wreak havoc. Since 2008 in South Florida, ficus whitefly infestations have been seasonally defoliating weeping fig hedges from Miami to Palm Beach, according to an article by Jon VanZile in the "Sun-Sentinel." While the insects don't kill the growth on the plants, defoliation weakens them and causes them to expend energy to rejuvenate. If other issues like drought or cold accompany the pests, die-back can result. The most obvious result of ficus whitefly is the lack of dense screening in the hedgerow. Time is needed for regrowth, and another whitefly attack still remains a possibility.